Just got the weather station connected and back online. It will take a while before all the graphs etc catch up with the current data. There is nothing for the period 4th to 27th. See all the station news. 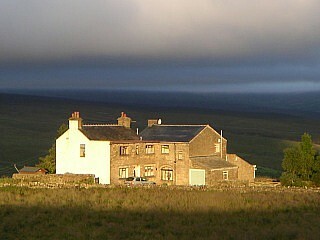 The station is located at an altitude of about 1400' in the North Pennines Area of Outstanding Natural Beauty. It is a rather exposed location compared with the village of Garrigill or the town of Alston, both of which are approximately 400' lower in the bottom of the South Tyne valley. Data are collected using an Oregon Scientific WM918 Electronic Weather Station purchased from Skyview Systems [ ] in the UK. This measures wind speed and direction, temperature and humidity inside and out, atmospheric pressure and rainfall. From these data it calculates wind-chill and dew-point. The availability or accuracy of weather data or information on this site is not guaranteed. It is provided purely as a personal interest and any use made of the data is entirely at your own risk. BBC North East England and Cumbria Weather [ ] The very nice Coastal Waters, Fell, Gardening and four day forecast is no longer routinely published. The above link is to a much more generic, and in my opinion less useful, forecast but at least it is updated regularly. Met Office - Lake District Mountain Forecast [ ] Gives "traffic light" risks for eight weather related risks in the mountains: Blizzards, heavy snow, storm force winds, gales, severe wind chill, hill fog, thunderstorms and heavy rain. Together with a day time rain probability, two day forecast and summary forecast for days three to five. 5-day Lake District Fell Forecast [ ] During the winter this forecast includes the daily felltop conditions report from Helvellyn. The other textual information is taken from the above Met Office link. Both of the above pages are for the Lake District Fells rather than the North Pennines so there can be differences but as a general guide they are useful.